Simply Lora's Beauty: Another Kitchen Gadget: Ice Cream Maker! 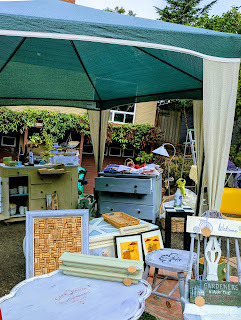 Last weekend was the Home and Patio Sale! I sold all the furniture except the two coffee tables which I'll list on craigslist. Best of all, a lot of furniture was saved from the landfill and (hopefully) will still be used for years to come. I also sold quite a bit of soap and once the weather cools down I'll need to replenish my stock of Peppermint Ice and Cinnamon and Honey goats' milk soap! Now, on to more important things, like ice cream! Fourth of July came and went this year with little fan-fare around our home. Since the holiday fell on a Tuesday it meant work on Monday, holiday Tuesday, and work on Wednesday. None the less, I thought I should do something for the holiday, after all, I did have the day off! Well that something led me to searching ice cream makers which in turn led me to this attachment for my KitchenAid mixer. I'm always amazed at the versatility of the KitchenAid mixer and this attachment did not disappoint. The most important thing about this attachment and how it's different from the many other KitchenAid attachments, is the bowl HAS TO be put in the freezer for AT LEAST 15 hours. Since that night we've made plenty of homemade ice cream that came out great. I've experimented with several recipes to find one that's awesome tasting but still not completely laden with high-fat cream and I think I've finally landed on one. So here it is, my first ORIGINAL (you won't find this anywhere else) recipe! Any and all kind of toppings you can think of! Mix sugar, yogurt, evaporated milk, and coconut milk together in separate bowl. Chop up toppings. I've used fresh mint, chocolate chips, walnuts, blueberries, mango, coconut, and yes, even Fruity Dino Bytes cereal. Add ingredients to ice cream maker and immediately start churning for 15-30 minutes until preferred ice cream consistency. Makes about 1 - 1 1/2 quarts. After making ice cream, clean the bowl and store it in your freezer so it will always be ready for the next batch! Also, if your ice cream tends to get super hard in your freezer and you end up bending spoons to get it out of the container, an easy hack is to store the container in a plastic bag, remove all the air from the bag, then place it in the freezer. This attachment works good on all versions of KitchenAid mixers; the kind where the head lifts back and the kind where the bowl lifts up. Summer won't last forever so start making ice cream today! Sounds great! I'll have to try that recipe.